Howdy all, here’s a nice little one for you and a nice little space gainer. 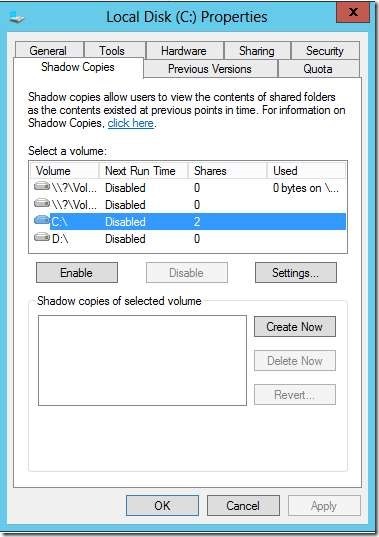 One of my clients servers was running low on space so I checked the Shadow Copies. While are good and do have their uses, if they’re not configure correctly or cleared once in a while they can cause other issues, mainly low disk space. This can cause to a load of other problems also such as Exchange and emails stop functioning as it requires a certain amount of free space to run. Anyway, so I checked the Shadow Copies tab in the properties of the C: drive and low and behold there was 90Gb of data being taken up, but also another volume \\?\Vol…… which had another 20Gb being taken up. Initially I thought I’d disable the Shadow Copies and enable them again, this should get rid of them I thought….no no no. Ok, so I just need to remove them using vssadmin in a command prompt, this is where I came a cropper. I opened up a command prompt (How to open command prompt) and ran the command vssadmin delete shadows /all but got the error: “Error: Snapshots were found, but they were outside of your allowed context. 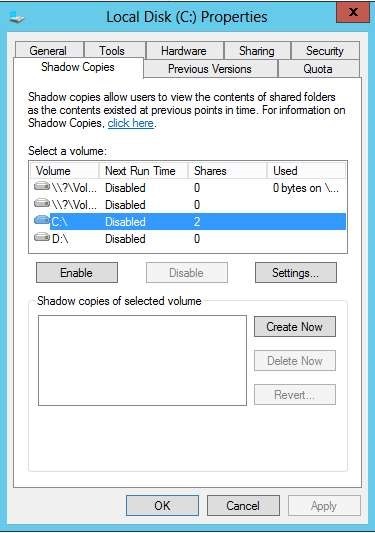 Try removing them with the backup application which created them.” Generally this means you’ve got corrupted Shadow Copies. Type: list shadows all (hit enter) – This will list all the shadow copies available and their ID so you can use the next command to remove each one separately. This will delete the corrupted shadow copies. You can then check the Shadow Copies tab in the properties of the C: drive and it should all look nice and clean again. You can configure them from here. Hope this gets you out of a sticky Quibble.